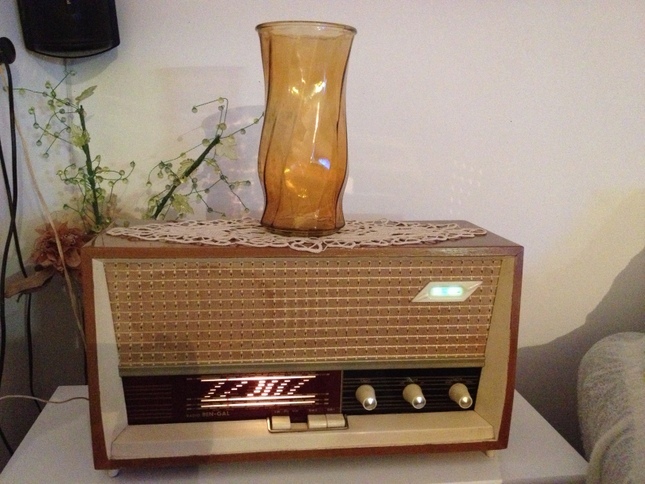 About 2 weeks ago, a very good friend called me and exclaimed, “you just have to see this radio…I’m keeping it for you!”–so, I drove to his aunt’s house and saw this beauty. 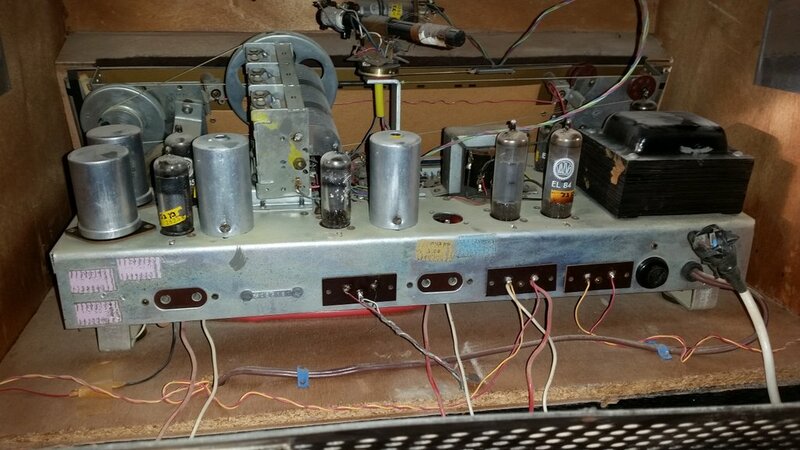 After hauling the radio to my place, I started to check it out, to see what would be needed for restoration; it was working, with bad contacts, poor frequency response and low output. I took hi-res pictures of this radio, some during restoration. Now the radio sounds great. It has been recapped, a couple of bad resistors and bad wires replaced, contacts have been cleaned, and some good cleaning for the chassis as well. 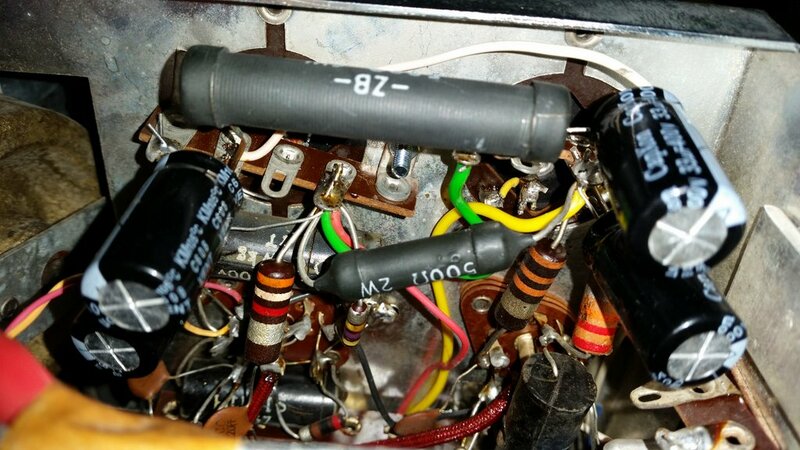 As I wanted to keep the original appearance of the chassis, I kept the original filter capacitors on board, but disconnected them from the circuit, added terminal strips and new capacitors from underneath. 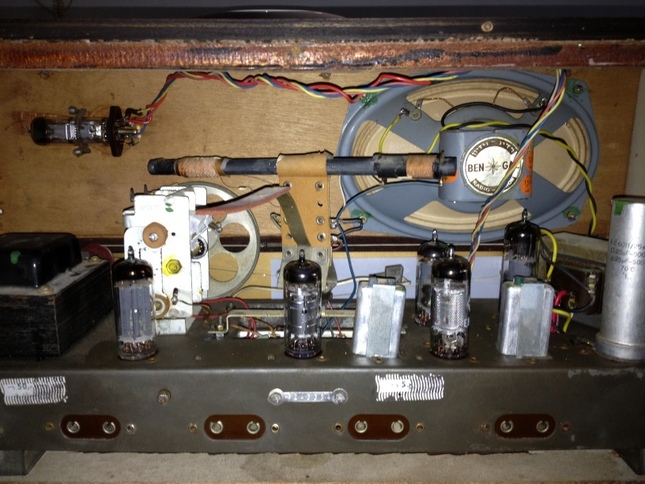 The radio uses an EF85 tube as the RF stage. With the addition of a grounding connection and random wire antenna, it’s very sensitive on shortwave. It was made in Israel by Ben-Gal, a label inside shows it was made at 12th of December, 1965. 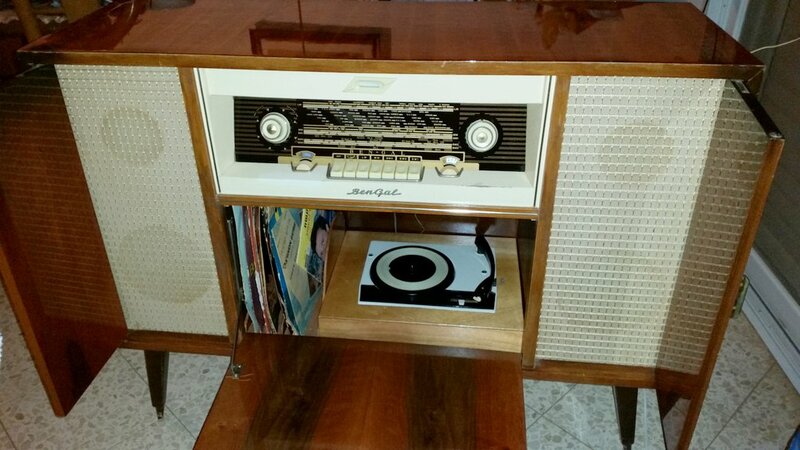 It is a console model with record player. As the model name suggests, the amplifier and record player are stereo (though the tuner is not…). The radio has longwave (marked in meters), mediumwave (marked in meters) and 3 shortwave bands (with megacycle and meter band marks). and SW1 14.5MHz to 23MHz. 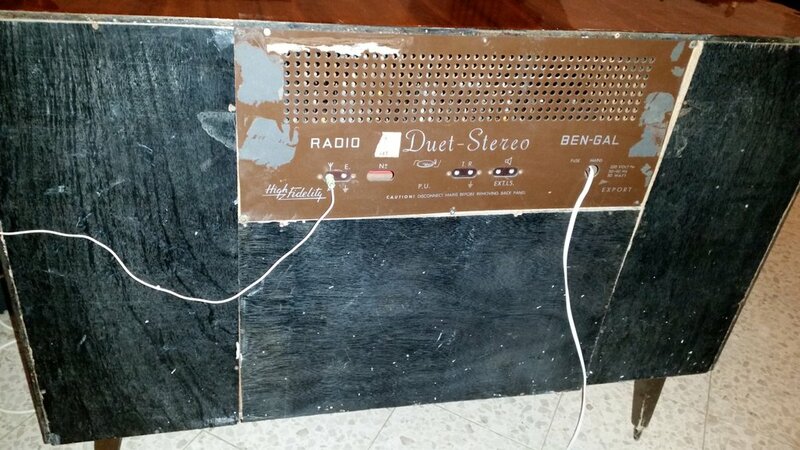 Many thanks, Moshe, for sharing photos and this description of this beautiful Ben-Gal Duet-Stereo. I bet the audio fidelity is amazing. My father has a 1960’s console–with a similar configuration–made by Admiral, though it was limited to mediumwave and FM reception. Some day, I will try to restore it to its former glory! Thanks for the inspiration, Moshe! 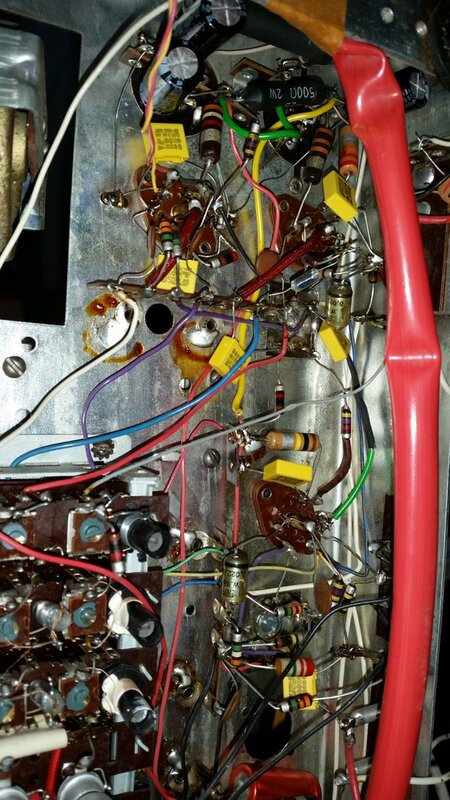 This entry was posted in AM, Longwave, Mediumwave, News, Nostalgia, Radio History, Radio Modifications and tagged Ben-Gal, Ben-Gal Duet-Stereo, Console Radios, Moshe, Radio Restoration on August 20, 2015 by Thomas. 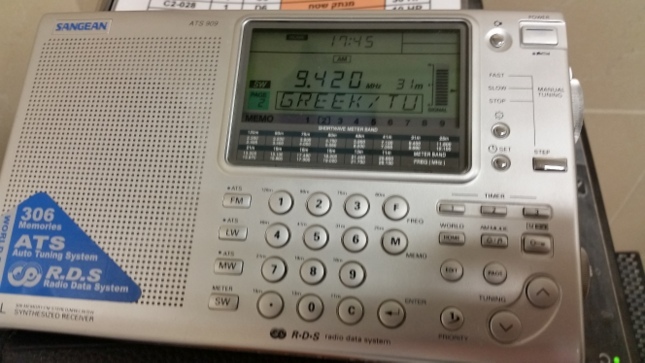 In the attached photos my Sangean receives Elliniki Radiophonia at 9420kHz at my working post. 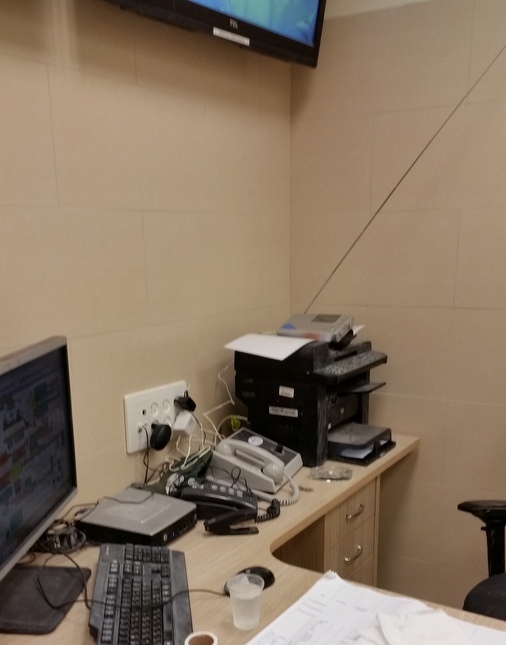 Note the amount of computers, screens and the fact that the radio sits on top of an HP printer. Still audio is clear and clear reception with only telescopic antenna. 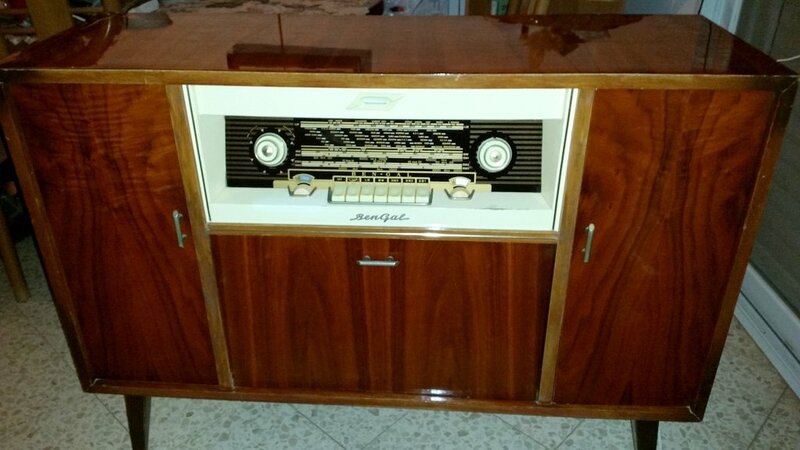 The other radio is my beloved Ben-Gal 1958 tube radio (Israeli made). 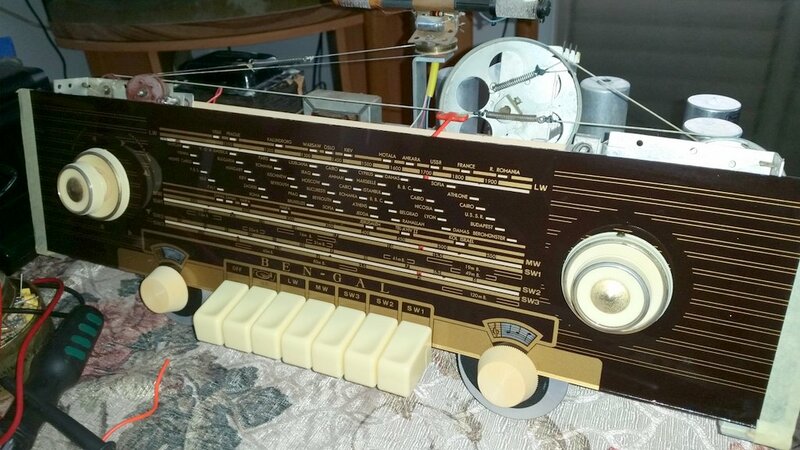 It looks very much like German radios of the time. Many thanks for sharing these photos, Moshe! Your reception of Elliniki Radiophonia must be exceptional in Israel to overcome all of that office RFI. The Ben-Gal must produce some rich audio; I bet it’s a champ on medium wave with that large internal ferrite bar! Beautiful set! Thanks again for sharing! 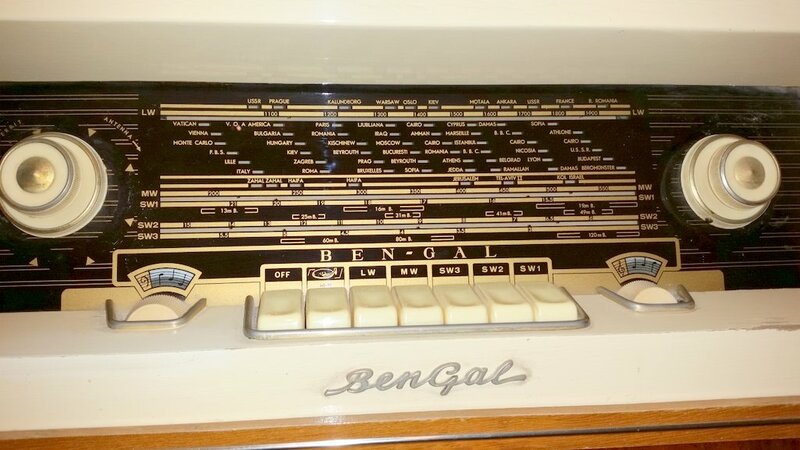 This entry was posted in News, Photos, Radio History, Radios, Shortwave Radio, SWLers and tagged Ben-Gal, Moshe, Photos, Sangean ATS-505 on February 26, 2015 by Thomas.